Government has said the plastics manufacturing companies must stop producing thin plastic bags within the coming two days. June 30, which is Tuesday next week, is a cut off point for the use, sale, production, exportation and importation of plastic bags of less than 60 microns. The government placed a ban on thin plastic bags, which many Malawians use for shopping, in June last year but manufacturers under the Plastic Manufacturers Association of Malawi (PMAM) obtained a court order against the ban. That time the manufacturers asked for more time to finish using the production materials which they had just bought before accommodating the ban. In an interview on Thursday, spokesperson in the department of environmental affairs in the Ministry of Natural Resources, Energy and Mining, Sangwani Phiri, said all PMAM members are aware of the deadline and the government expects no excuses. “This issue has been there, we have been discussing, we have been engaging them on a number of occasions and they know how to change their factory set-up to the required standards on the production of the plastic bags,” Phiri said. He said on the part of consumers who have been enjoying the use of thin plastic bags, campaigns have been there and the ministry is now trying to promote the use of materials other than plastic. “It could be recycled paper or shopping bags. Even if you buy a plastic bag which is thick it would be unfortunate to just throw it away after using it once because you can use it time and time again,” he said. Some thin plastic bag consumers that we interviewed in the streets of Blantyre said they are ready to embrace the new system. 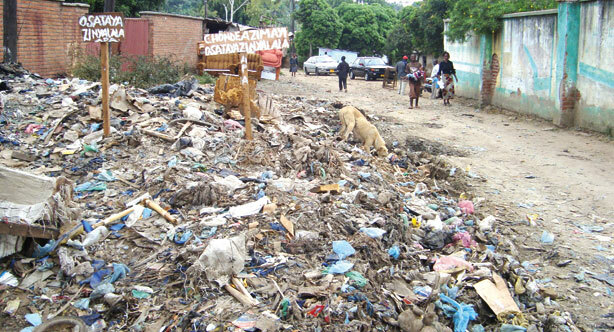 Manase township resident, Francis Kuntambila, said the thin plastic bags make the environment filthy and hopes the ban will result into a clean environment. “If you look around town, you will observe that these plastic bags constitute more than 50 percent of the litter that we usually have. I think the ban will at least bring environmental sanity in our areas,” Kuntambila said. Another Blantyre resident, Mable Kachiundo, said the ban will ensure that people buy bags which they can use for a long time instead of buying plastic bags every time they go shopping. Meanwhile, Phiri has said the department of environmental affairs is encouraging groups and companies interested in recycling papers. “We are ready to provide the expertise and whatever help the interested groups may need. What we want is to promote the recycling of plastic papers. There are already two companies that have shown interest in this recycling business and we want more,” he said. Thin plastic bags are produced and used in large quantities but have a slow decomposition rate. Moses Chitsulo – who has written 614 posts on The Times Group.